The Security Lens represents a ‘security’ worldview, i.e. that undesired user behaviour is something to deter and/or prevent though ‘countermeasures’ designed into products, systems and environments, both physically and online, with examples such as digital rights management. From a designer’s point of view, this can be an ‘unfriendly’ – and in some circumstances unethical – view to take, effectively treating users as ‘guilty until proven innocent’. However, thinking more closely about the patterns, it’s possible to think of ways that they could be applied to help users control their own habits or behaviour for their own benefit – encouraging exercise, reducing energy use, and so on. This pattern is about constraining user behaviour. â– Atmospherics can be ‘discriminatory’, i.e. targeted at particular classes of users, based on some characteristic enabling them to be singled out – such as the pink lights supposed to make teenagers with acne too embarrassed to hang around – or ‘blanket’, i.e. targeted at all users, e.g. Bitrex, a bitter substance, used to discourage drinking weedkiller or biting your nails. but can also motivate a user, e.g. pleasant sensations such as the fresh bread smell used in supermarkets can encourage purchases. â– It’s not nice, but the threat of damage (or injury) lies behind many measures designed to influence behaviour, from tyre damage spikes to barbed wire, electric fences, shards of glass cemented into the top of walls, and so on. â– In some cases the threat alone is hoped to be enough to dissuade particular behaviours; in others, it’s expected that some mild injury or discomfort will occur but put people off doing it again. Warnings are often used (and may be legally required), but this is not always the case. Example: Various kinds of ‘skate stopper’ in public places, such as this so-called pig ear are designed to cause damage to skateboards (and injury to skateboarders) to dissuade them from skating an area. â– ‘What you have’ relies on a user possessing a certain tool or device to enable functionality or gain access. â– ‘What you know or can do’ relies on the capabilities of users – some information or ability which only a subset of users can provide. The most obvious examples are passwords and exams (e.g. driving tests) – testing users’ knowledge / understanding before ‘allowing’ them to perform some behaviour. Often one capability stands as a proxy for another, e.g. CAPTCHAs separating humans from automated bots. â– These are often interlocks – e.g. breathalyser interlocks on car ignitions, or, one stage further, the ‘puzzle’ interlocks tested during the 1970s, where a driver had to complete an electronic puzzle before the car would start, thus (potentially) catching tiredness or drug use as well as intoxication. 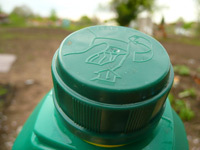 Example: Childproof lids on bottles of potentially dangerous substances – such as this weedkiller – help prevent access by children, but can also make it difficult for adults with limited dexterity. â– Design based on ‘who you are’ intends to allow or prevent behaviour based on some criteria innate to each individual or group – usually biometric – which can’t be acquired by others. â– The aim is usually strong denial of access to anyone not authenticated, but there are also cases of primarily self-imposed ‘who you are’ security, such as the Mukurtu system, stamping ‘Confidential’ on documents, and so on. Example: Fingerprint scanners are becoming increasingly common on computer hardware. â– Systems which alter the options available to users based on their current / past behaviour are increasingly easy to imagine as the technology for logging and tracking actions becomes easier to include in products (see also Surveillance). Products which ration people’s use, or require some ‘work’ to achieve a goal, fit in here. â– These could simply ‘lock out’ someone who has abused/misused a system (as happens with various anti-spam systems), or, more subtly, could divide users into classes based on their previous behaviour and provide different levels of functionality in the future. â– Examples include buildings intended to have no mobile phone reception (perhaps ‘for security reasons’, or maybe for the benefit of other users, e.g. in a cinema), and IP address geographic filtering, where website users identified as being in different countries are given access to different content. 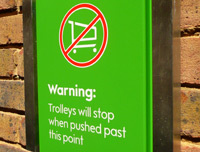 Example: Some supermarket trolleys have devices fitted to lock the wheels, mechanically or electronically when taken outside a defined area. Less high-tech versions have also been used! Photos/screenshots by Dan Lockton except fingerprint scanner by Josh Bancroft and Square Eyes photo from Brunel University press office. Dan, what do you think is the difference between the two types of surveillance you describe? Natural vs. technological. IMHO, the balance of power is important. When we look out for each other, no one person has too much control over another. With CCTV, the owner of the camera has total control. There’s a feeling with CCTV, for me, that negates your personal ability to deal with a situation. If people don’t like what I’m doing, and they tell me, we can sort out a solution. CCTV assumes that’s not an option; that evidence and proceedure are needed to stop unwanted behavior. The best solution for anti-social behaviour is empathy, and you don’t get that through a camera lens. Thanks Felix, sorry for the delay in replying. You are right, of course – surveillance could certainly be broken down further into at least those two categories. The balance of power you mention is interesting – a CCTV camera doesn’t allow equiveillance in the same way that natural surveillance by someone you can see does. But what about where there are real people doing the surveillance, but we can’t see them – the curtain-twitchers, the secret surveillance vans, Bentham’s Panopticon, and so on? That isn’t necessarily technological, but it is one-sided (though there is this). Not all surveillance is about actually influencing people’s behaviour, of course. Some is, but if a camera (or observer) is hidden, and we’re completely unaware that they’re there, then it seems as though it’s really an evidence-gathering method rather than a deterrent to certain behaviour at all. Whereas a visible camera (and in the extreme, a fake visible camera really is about influencing behaviour. Your point that “if people don’t like what I’m doing, and they tell me, we can sort out a solution” describes a situation where people actually interact with each other to influence each other’s behaviour (or attitudes) in one way or another, but as you say, you don’t get empathy through the camera lens and the first you hear about it may be after the event, when it’s too late to influence your behaviour. People became more honest after reading the 10 Commandments, regardless of faith. Children were more honest when they were within sight of their own reflection.